Released for the first time in complete form! Tenor titan Sonny Rollins' recorded outputs are scarce between 1996 when he left Impulse! and 1972 when he began recording for Milestone. 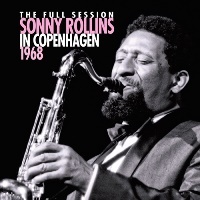 In 1968, Rollins performed three tunes for videotaping in a Danish TV studio in Copenhagen while he was appearing at Jazzhus Montmartre with the club's house rhythm section at the time -- Kenny Drew (p), Niels-Henning Orsted Pedersen (b) and Albert Heath (ds). The DVD release (Live in '65 & '68) was the same as the TV broadcast, which required making some cuts of each track in order to fit the broadcast time limit. This CD, however, is the world premier release of the complete version of the performance as the quartet played it in the studio. An important document of Sonny Rollins from 1968, backed by a superb rhythm section! A must-have for fans of Sonny Rollins! Recorded September 8, 1968 in Copenhagen, Denmark. Mono.